First there is a long stretch of dense, tree lined highway in which you pass sleepy rural towns with humble main streets peppered with long standing local businesses. Eventually the billboards begin to pop up. To the uninitiated the adverts seem out of place: big, flashy signs for alcohol brands. Further on they start showcasing dice, slot machines, and attractive people laughing over the blackjack table. Soon enough bright lights appear on the horizon, and the smell of salt water permeates through your closed car windows. The horizon of casino lights eventually encompasses the entire width of your windshield, and at the end of the Atlantic City Expressway there is one last billboard: In 1 Mile, You Will Be 1,000,000 Miles Away. The reality of Atlantic City isn’t as lavish as the billboards suggest, but in many ways that makes it a better, more authentic experience. The real Atlantic City presents a head scratching dichotomy: a small town environment that masquerades as a big city. Even when inside a casino, with all of its feigned opulence and difficult to navigate corridors, the people found within have always had local flavor. When I first came to Atlantic City I was a shoobie. My experience was limited to summer vacations in Ocean City and Sea Isle and occasional concerts at the casinos. I thought breakfasts down the shore were always done at Uncle Bill’s pancake houses and the best pizza was Mack & Manco’s. I had never even had tacos down the shore. I thought I truly understood the place; but the reality was my perception reeked of that of a weekender, a tourist, an outsider, or as the notorious colloquialism goes: shoobie. Most disparaging of all, I have come to realize, is that I never took the time to ponder the year round livelihood of Jersey shore residents. What did they do when us summer squatters returned to Cherry Hill, to Moorestown, to the Main Line? We content ourselves on flooding the beaches and casinos for three months, then come Labor day the only thing flooded is the northbound side of the Garden State Parkway as we all escape back to suburbia. We had raided the boardwalks and loaded up on Salt Water taffy. We returned our rented umbrellas, vacuumed sand out of our cars, and stored away our beach tags in hopes of reusing them next summer to avoid paying again for access to the shoreline. All the while no one gave one iota of thought to what these store owners, casino workers, and year round residents do for the remaining 9 months. It’s almost as if they don’t exist except to open their community to tourists: to feed us, to clean up our trash, to serve us. Don’t get me wrong: shoobies are invaluable to the local economy, and their patronage is essential to the continued preservation of the New Jersey coast line. But what shoobs need to remember is that they’re needed the rest of the year, too. And there is plenty for them to do. I first came to Atlantic City on a cool Thursday in September. We were headed to The Boneyard: a small, local music bar on Virginia Ave a few hundred yards from the Taj Mahal. I had never been to a place in Atlantic City that wasn’t located within a casino, and I had no idea what to expect. People (re: shoobies) never had much to say about the rest of Atlantic City, and when they did say something, it wasn’t positive. My boyfriend was entering a DJ competition there and I didn’t know a soul. I was apprehensive. But, never one to shy away from new social gatherings, I tagged along. It didn’t take more than an hour or two to feel comfortable. Turns out I did know some people there, and the ones I didn’t know I soon would. The vibe was easy and friendly. People were down to earth. The attire was Anything Goes: from blue mohawks and sleeve tattoos to high heels and fake lashes. There was even a group dressed gothic: complete with studded face masks and large, bulky pants littered with straps. I dare say the goth kids were actually some of the nicest: they were some of my first friends down there. The food was delicious and the drinks were cheap. After only one night I had decided that this dive bar in Atlantic City, of all locations, was my kind of place. My boyfriend ended up winning that DJ competition, securing him a residency at Boneyard Bar & Grill every Thursday night. And so began a sacred ritual: each Thursday around 8 p.m. I would travel down the Expressway to Atlantic City. We would eat, drink, and dance like no where I could think of in quiet, suburban Medford. Once a week turned to twice, and sometimes three times a week I would venture down to AC to see what was going on. Sometimes it was to support music and comedy events put on by my friends, sometimes just because I wanted to get out and couldn’t think of a single place by me that I would rather go. 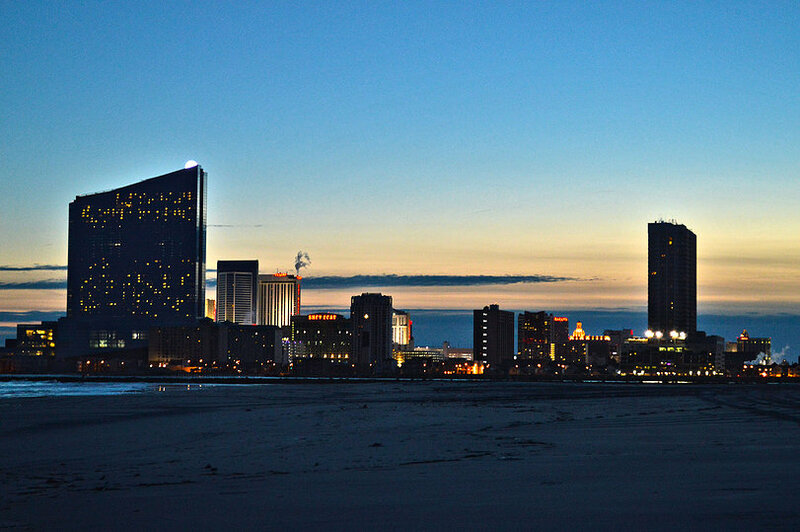 I came to Atlantic City for the music, and I stayed for the people. I made real friends there, probably upwards of 100 of them. There were so many types of people: musicians, hair stylists, bartenders, news reporters, DJs, waiters, construction workers, chefs, comedians, college students, postal workers, nurses, people in lawncare maintenance, tech industry professionals, masseuses, promoters, artists. They all wove into this unique identity of Atlantic City. Many came from the small surrounding towns you pass on the Expressway, some were born and raised right on the island. And everyone had a story. I listened to two ex-enlisted guys compare their experiences in Afghanistan. I got hair styling advice, casino industry gossip, and restaurant discounts. I saw fire breather demonstrations and glow in the dark hula hoop dancers. I participated in trivia contests, and contributed to live, group paint sessions on canvases set up at music events. I strategized with friends trying to start their own endeavors: lifestyle brands, restaurant managers, and event organizers. Once I stayed late to the bar drinking water to sober up, and the bartender and another patron traded crazy stories about their alcoholic parents. We used our insider discounts to stay at the casinos overnight. Soon I learned that breakfasts were actually done at Shea’s and Gilchrist. Pre-game tacos were at Panchos, and for late night fare we always went to Pizza King. We played beer pong at Mountain Bar at Bally’s until 3 a.m., and sometimes the guys would get DJ gigs at Dusk, a dress code enforced nightclub at Caesars. We stopped at Boneyard unplanned once on a Saturday night because it was my boyfriend’s cousins birthday and she wanted to go out. Lo and behold there was an air guitar contest on stage. I entered on a whim, and after many grueling rounds I was crowned the winner. The organizers requested an encore performance at the end, and I invited all the contestants on stage to perform with me. It crescendoed with myself and at least a dozen other people in a raucous air strumming, lip syncing rendition of Bohemian Rhapsody. Afterwards the entire bar sang happy birthday to our guest and the owner bought everyone there a shot of whiskey. It was one of the most hilarious nights of my life. All of this goes on in Atlantic City under the shadowy nose of the crippling casino industry. The real and truly authentic people that comprise Atlantic City are crumbling beneath the gargantuan, bankrupt towers they were told were built to save them: their job, their livelihood, their city. In reality, these extravagant constructions merely contain them. The people found in Atlantic City truly sparkle far greater than the glittering chandeliers above them. Every week lately seems to bring news of another casino closure. I shudder to think of the thousands of residents these failing casinos are rendering jobless. Politicians and city officials have failed this city, but I haven’t lost hope. The time I spent getting a true Atlantic City experience has taught me that a city can be defined not by its grandiose buildings, but rather by its people. And now more than ever Atlantic City is ripe for reinvention by the eclectic people that make it special.